I authorize Can Fin Homes & its representatives to contact me with reference to my request. 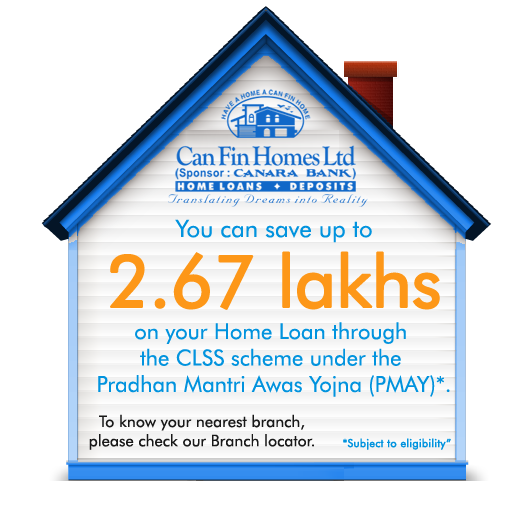 Can Fin Homes Ltd is one of the top players in the housing finance sector, in the country today. The Company has completed 31 successful years of operation in the field of home finance and has a renowned history of making profits and paying dividends continuously, since inception in 1987. The company, as on date, has 154 Branches, 21 Affordable Housing Loan Centres (AHLCs) & 14 Satellite Offices spread across various locations of the country in 21 States & Union Territories. All these branches and satellite offices are linked to the Registered Office at Bangalore through a core banking platform. Being a south based company, 70% of its branches are located in southern India. The checklist for documents required for Housing loans, Non Housing loans and Deposits indicates all the necessary documents that are required for the loan process. Please keep all the documents handy as per the list for a hassle-free loan experience. The spirit of friendship finance is embedded in our customer service. However, despite our best efforts, in certain occasions an aggrieved customer wants to voice his concerns. The grievance Redressal forum is meant to provide our valued customer a platform for the same. The concern expressed by our valued customer will help us to improve our services. An instant reckoner for loan eligibility/EMI amount based on inputs like present income, existing liabilities, required loan amount, the amount that can be spared per month for loan repayment, loan tenure and rate of interest (ROI) and for Deposits based on inputs like rate of interest (ROI) and tenure of the deposit. It will show an indicative amortisation schedule at a given ROI. However, the actual amortisation schedule will change based on the change in ROI during the loan period. © 2018 Can Fin Homes Ltd. All rights reserved.